Maxwell’s equations showed the link between electricity and magnetism in space. A changing electric current produced a magnetic field and a changing magnetic field produced an electric current. These appear to be related through a pair of constants, permeability and permittivity. Permeability and permittivity appeared to be properties of space itself, but as such they imply the presence of a universal substance or ether. The idea of such a substance was not new, it had been around since at least the 17th century and the work of Descartes, Huygens and Hooke, although Newton was opposed to the idea. Not long after Maxwell published his eponymous equations in 1873, in 1887, two American researches Albert Michelson (1852 – 1931) and Edward Morley (1838 – 1923) set about trying to prove the existence of this mysterious substance. The luminiferous (or light bearing) ether was the descendent of Descartes’ plenum. It was supposed that it was a universal medium which pervaded all of space. The ether was a continuous medium which had no mass but did have elastic properties which enabled it to transmit the wavelike motions of electromagnetic radiation. Michelson and Morley reasoned that the earth must be moving through the ether which must therefore be acting like a wind with a flow in some particular direction. A measurement of the speed of light made parallel to the direction of the ether wind would either be increased or decreased depending on whether it was made in the direction of the flow or against it. A measurement made at right angles would not suffer this change and so would be different. They set about trying to measure these differences. Michelson had constructed an apparatus called an interferometer which took a single beam of light and split it with a half silvered mirror, sending the two beams off at right angles. The beams were reflected back to a detector where they were recombined, any differences in the time taken by the two beams to complete their journey would alter the interference pattern caused by their recombination. Michelson’s original apparatus was not sufficiently sensitive to measure the expected difference in the two velocities, so he teamed up with Morley. Working together they refined the apparatus by folding the optical path of the two light beams using mirrors to increase the path length and so increase the sensitivity. The whole experiment was mounted on a massive turntable made out of a block of marble floating in a bath of mercury. This allowed them to rotate the experiment, so making the comparison in any direction. As the experiment was rotated through 360 degrees they expected each of the two arms to line up with the ether wind twice, once where it would act to add to the velocity and once where it would subtract from the velocity and so they expected to see the differences in velocity as a sinusoid. There might still exist the possibility that they had chosen to make both measurements normal to the direction of the ether wind. To guard against this possibility the experiment would have to be repeated at different times of day when the earth’s rotation would present the apparatus at a different angle to the ether wind. They also took the step of making measurements at different times of year arguing that the earth’s orbital path would mean that at certain times of year the velocity of the earth in its orbit around the sun would add to the ether wind and at other times it would subtract from it. Despite all their careful preparation and meticulous efforts Michelson and Morley were not able to detect any differences which would indicate the presence of an ether wind and an ether like substance. The Michelson Morley experiment has since come to be known as the most successful experimental failure in history, since it set out to prove the existence of the ether and to measure its properties, but in failing to do so it effectively proved that the ether does not exist. Space it seems is a vacuum, and that vacuum is devoid of anything. 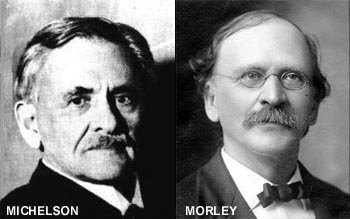 In more recent times variations on the original Michelson-Morley experiment have been carried out using lasers and masers. An experiment was developed in 1958 by Charles H Townes (1915 – present) and demonstrated that, if there was an ether, it had to be moving with respect to the earth at less than 30 m/s. In 1978 this experiment was repeated with even more accurate results showing the ether drift to be less than 0.25 m/s and since then it has been shown to be less than 10-13m/s. These experiments show that the ether does not exist, and yet scientists have been reluctant to give up on the idea, since a medium of transmission is central to the idea of a wave. As recently as 1951 Paul Dirac acknowledged that “we are rather forced to have an ether”. This presents a problem since by ascribing properties such as permeability and permittivity to empty space, Maxwell’s equations are interpreted as showing that the ether does exist. There is a paradox, either there is an ether and the current interpretation of Maxwell’s equations is correct or there is not an ether and the current interpretation of Maxwell’s equations is incorrect and needs revising. For some inexplicable reason modern physics has gravitated towards the former, clinging desperately to the ideas that underpin an ether while at the same time trying to deny its existence. The current standard model asserts that, according to Maxwell, space itself is endowed with properties of permittivity and permeability which sustain the propagation of a wavelike photon. To endow space with these properties is in fact to restate the existence of the ether, contrary to what Michelson and Morley clearly demonstrated. There is an alternative explanation: that it is not empty space that supports properties such as permittivity and permeability, but the characteristics and juxtaposition of particles themselves present in that otherwise empty space. In other words it is the movement of a charged particle creates a magnetic field and it is the presence of a magnetic field which causes a charged particle to experience a force. Space itself does is then devoid of all properties. Properties are exclusively the preserve of particles. Indeed one might then use this to suggest the definition of a particle as a point in space possessed of, and surrounded by physical properties. This raises one interesting problem. As far as we can tell all indivisible particles possess the property of mass, with the exception of particles such as the photon (gauge bosons), which appear to have no mass. Historically the approach taken has therefore been to describe such particles as waves propagating through space and so we return to an argument which is circular: for this to be the case, space must possess properties and these in turn imply the ether, which Michelson and Morley proved does not exist. To break this vicious circle we need an alternative theory, one in which the photon can exist as a real physical entity but at the same time one in which the photon has no mass.